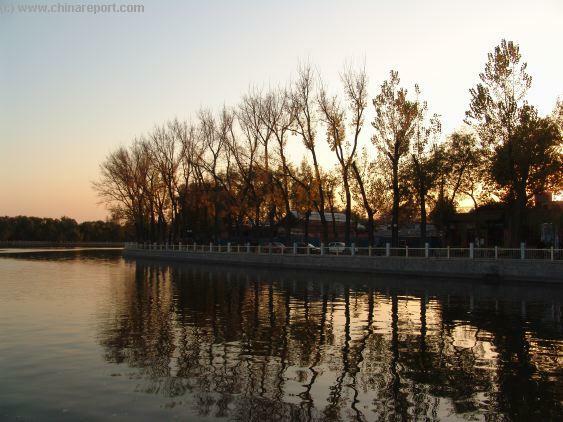 Both HouHai and QianHai Lakes are now a popular recreational area, perfect for boat rides and even swimming during Beijing's hot & humid summers. Lately many Bars and dancings have sprung up in the lake area, leading a new nightlife hotspot. Neighbours have complained of nightly noise and legislation to curb the number of new establishments have been introduced in 2004. 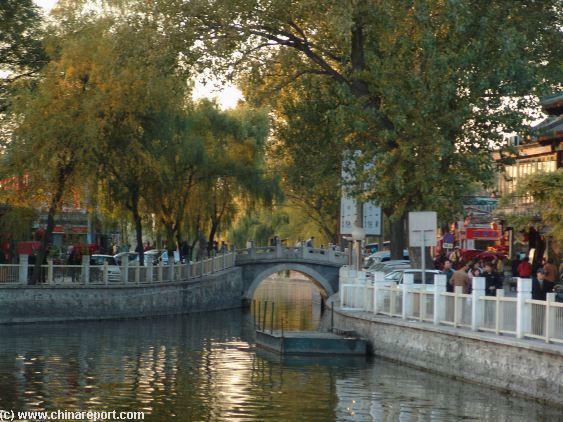 Welcome to China Report's Digital Introduction to JinDing Bridge , between Houhai and Qian Hai Lake on the border of DongCheng- and XiCheng Districts. 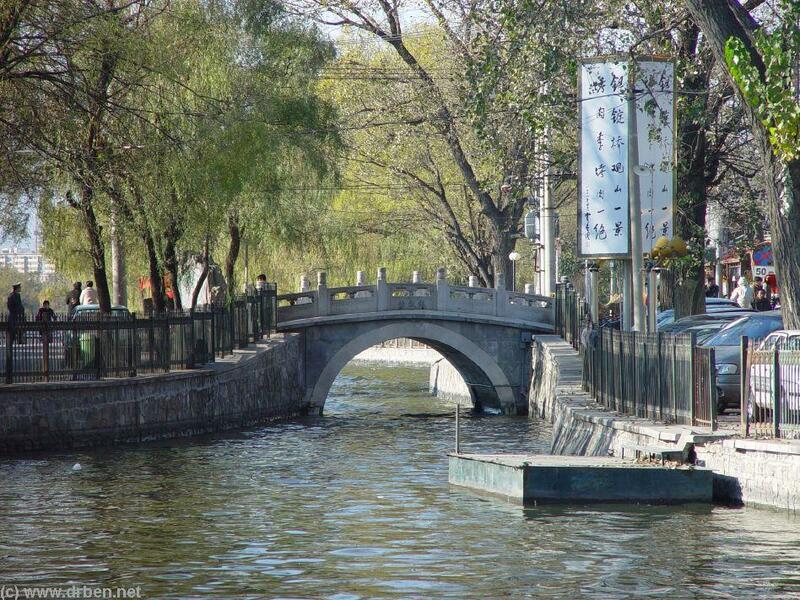 Fresh water flows from Beijing's Western mountains into KunMing Lake at the Summer Palace. 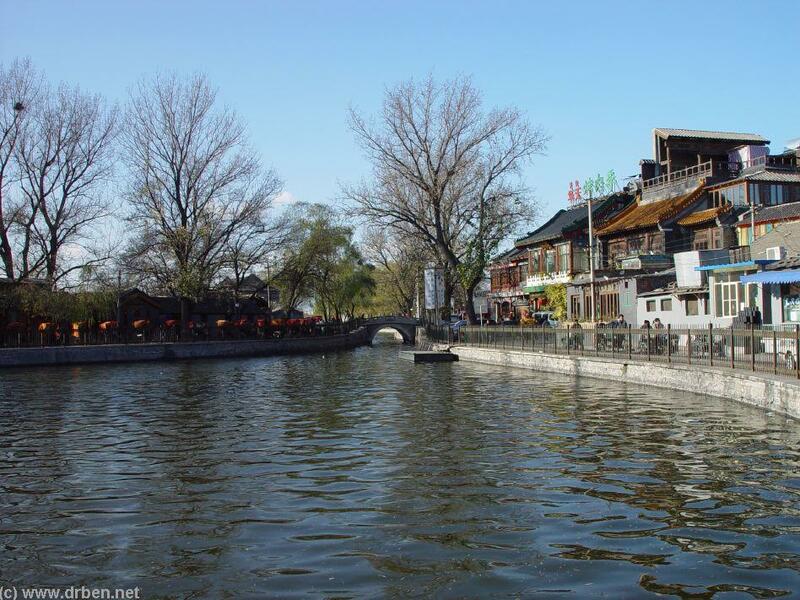 From there it flows through a number of Canals (north of Beijing Zoo), into HouHai Lake. 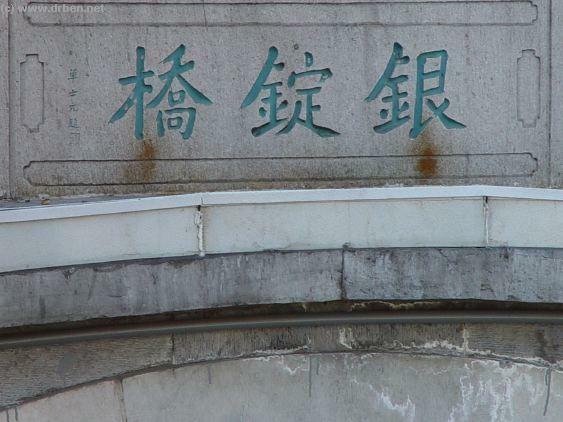 From HouHai, the water passes into QianHai (Hai=Lake) under Jin Ding Bridge. 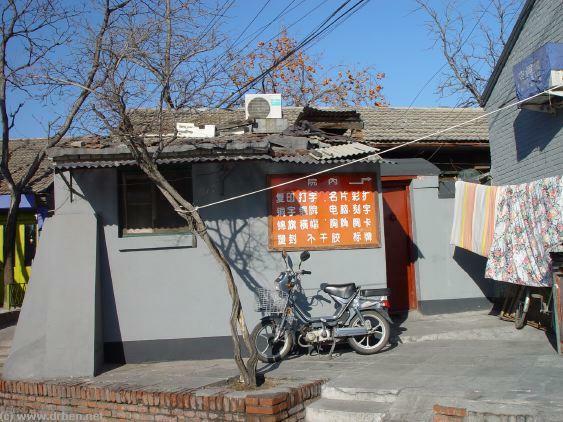 The refound popularity of modern day Houhai with it's bars began in earnest when local Star and Socialite, ex-concert cellist Bai Feng opened his 'No Name' bar. This Bar drew in the City Hip by word of mouth. 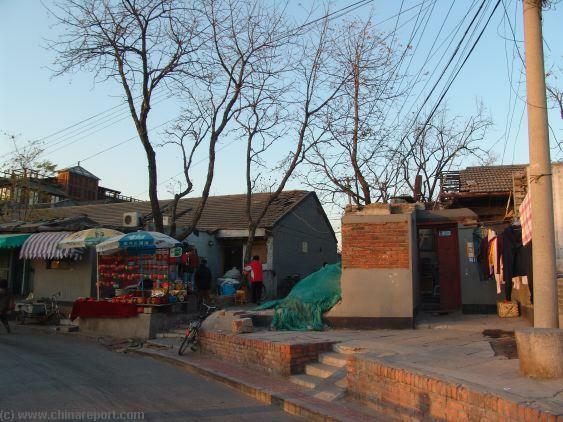 Eversince an explosion of bars and now galleries have popped up in shishahai (back lakes) area, drastically reshaping the nightlife in this beforehand quiet area. 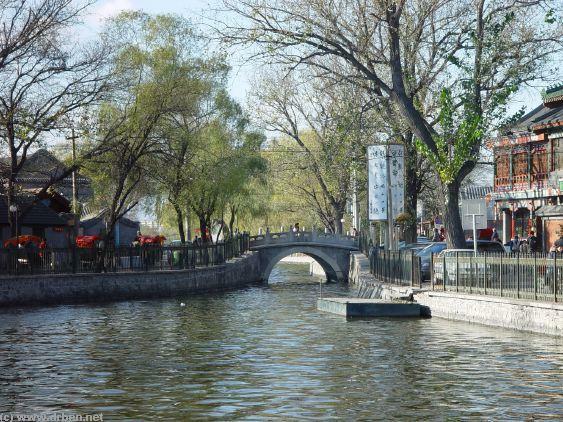 The entire lake area transforms into a new bohemian Beijing with plenty of nean lights, modern and mixed styles of music and other attractions. 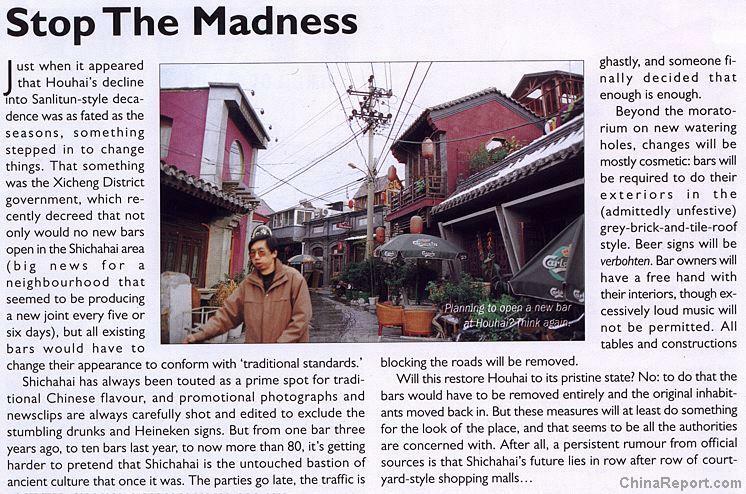 Get by by selling art, making music and performing on- and off-stage, own their own private little IT-Companies, but whichever , do not really hold any steady and permanent Jobs, and often if not certainly therefor do not have the required Residence Permit - Hukou, to stay within the Inner City. Some of them have grown to fame. Opened Bars & Businesses, or broke through as an artist, TV presenter or IT Company. Both HouHai and QianHai have been declared official Imperial Pleasure Gardens during the Guangxu reign of the Ching Dynasty. They were then off-limits to the general public. Again available after the establishment of The peoples Governement of China with Beijing as it's Capital, the lake Gardens were opened to the Public. The View of Jin Ding Qiao - the Gold Ingot Bridge from the South and Qianhai Lakes Western Banks. 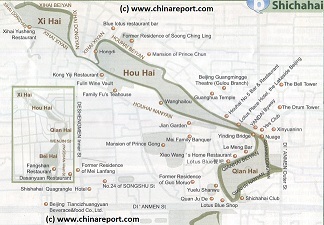 As prominent Lakes in the area North of the Beijing Palace Museum, both QianHai and Houhai are not very hard to locate. 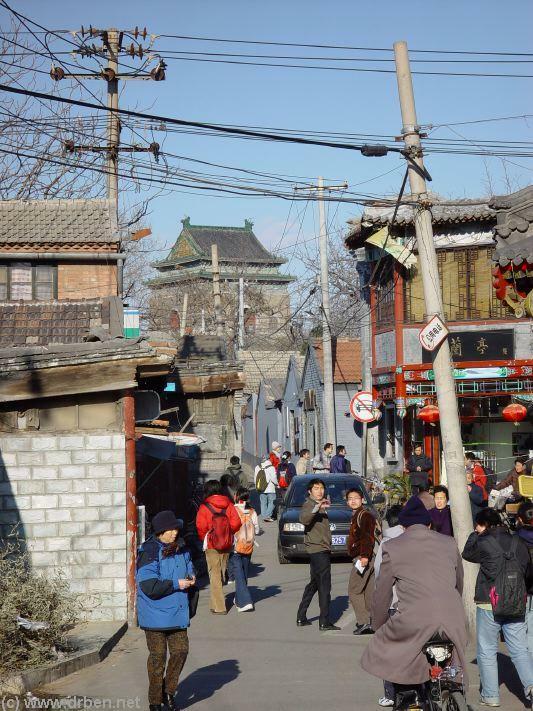 On your map, simply look for the Forbidden City / Palace Museum and the Coal Hill - Jingshan that stands immediatly North of it. 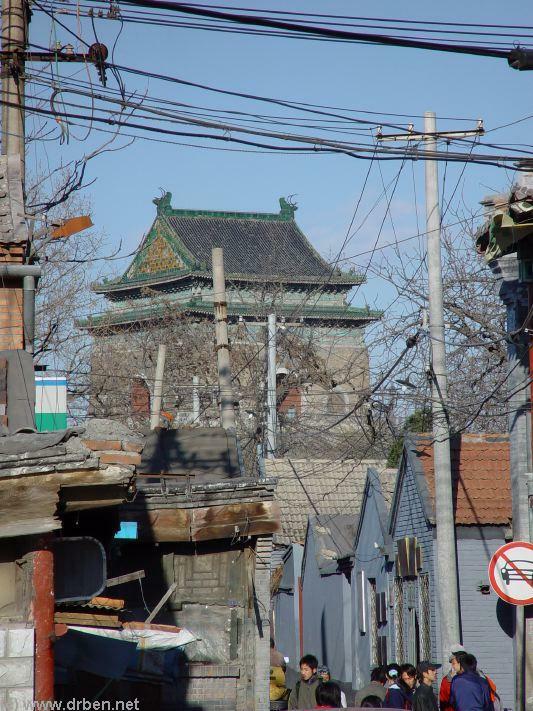 From Jingshan, go up on your Map, northward towards the Drum-Tower. 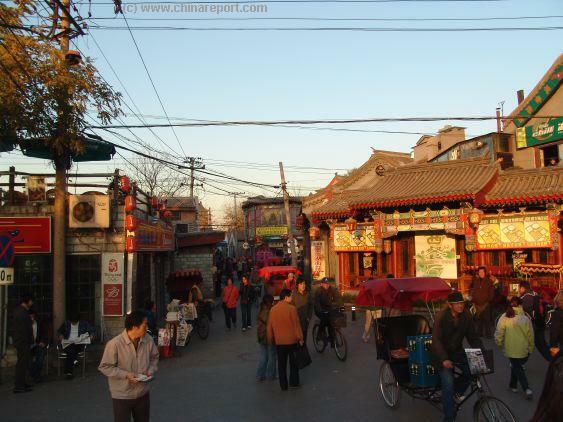 The Avenue between Jingshan and the Drum Tower is DianMen Dajie'. To find the Lakes, simply head up from Jingshan along Dianmen Inner Street - DianMen Nei Dajie'. 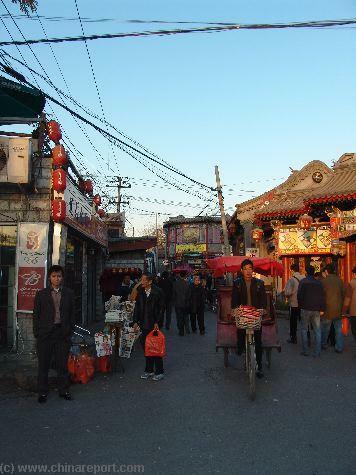 When one reaches the large intersection at DianMen (former Gate), either turn left and eastward to find QianHai and Lotus Lane or continue Northward towards the Drum Tower and turn Left and East Later. Jin Ding Bridge is reachable by following Qianhai to the North along it's western bank (not the dead-end Lotus Lane!). 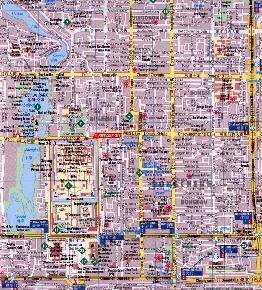 The shortest route is up DianMen Wai Dajie'. 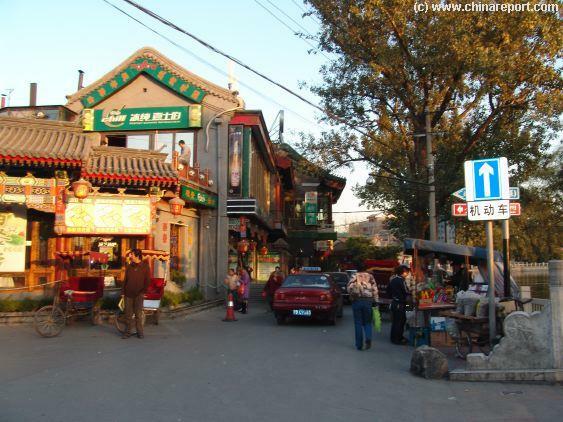 A short distance South of the Drum Tower, turn left and East into the traditional street, which will lead one to Jin Ding Bridge and the Bar Area of Houhai Lake. 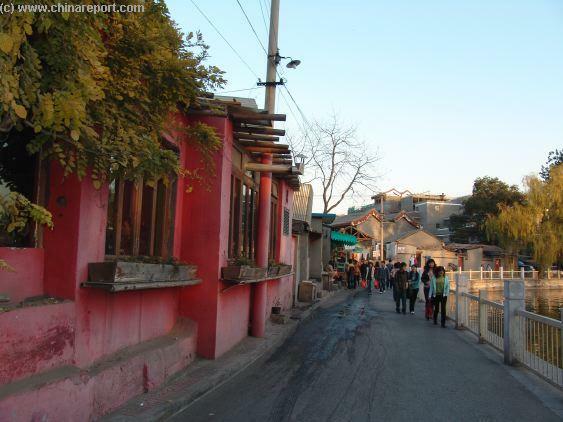 From Jin Ding Bridge all interesting cultural or hsitoric spots within the shishahai (back lakes) area can be easily reached. Either walk, or take a rickshaw ride to explore around. 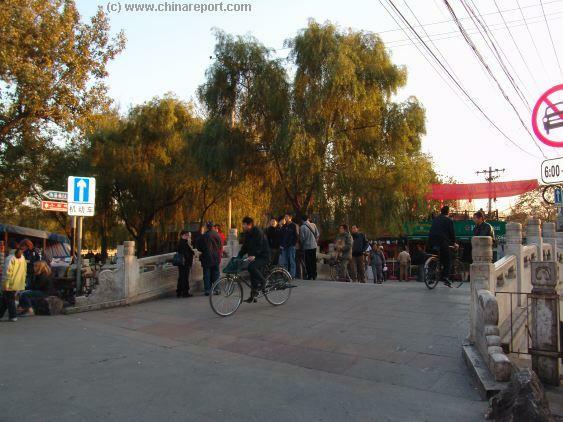 Tourists and locals loiter around Jin Ding Bridge in the afternoon. 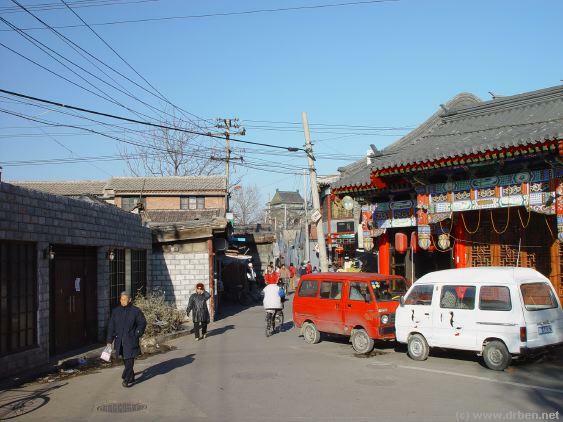 Traditional Street and Hutong leading North and away from Jin Ding Bridge toward the Drum Tower of Beijing. Sound Effect: Bar Noises, Drunken People. 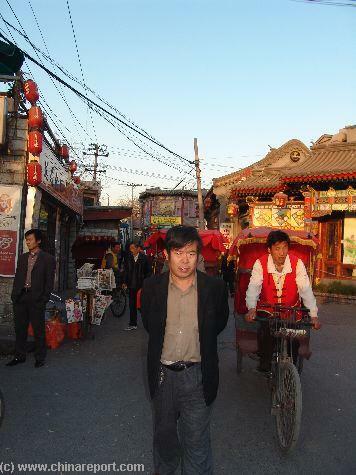 Rapid transformation of all parts in society in China, as well as the Beijing local City Life. 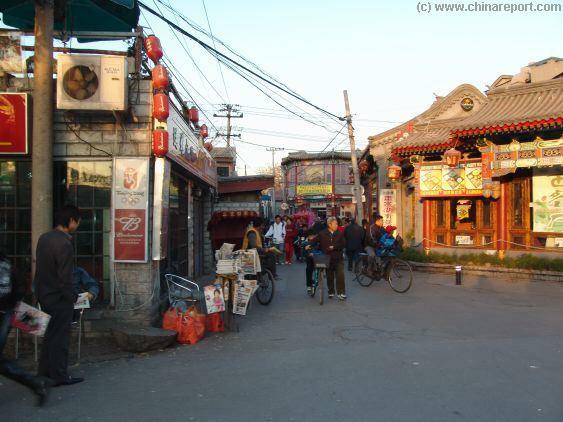 Houhai stands for both the quietness, familiarity and kozyness of the Hutong and the arts, Caligraphy and Literature through the Heritage of the Imperial Legacy and the magnificent former Imperial Mansions surrounding the Lake. Current day Migrants and City Intellectuals. A growing stream of backpackers and other International Tourists. 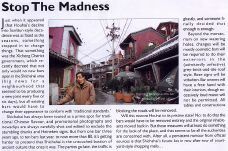 Discrimination from Beijing Locals, as young out of towners. Their language is not the Beijing-toned Mandarin. Their hometown versus the possibilities and freedoms of Live in the City. And risk and uncertainty, high rents and self expectations. high rents and self expectations. Excluded from city medical services, not heard by local politicians and committees, in some area's of the City these coming-up talent, urban migrants of various talents make up 50% of citizenry.